I have been wanting to make a trip to the outlets forever so I grabbed a girlfriend and we shopped till we dropped. Being YummoMummo, you can imagine I was busting to share with you what I found and at amazing prices. Tourists flock from miles and other countries with empty suitcases to troll the Outlets for amazing deals to be fashionably found. 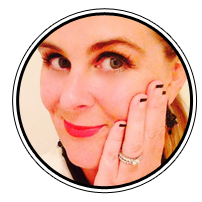 I had just been through my wardrobe and done a massive re-organiation/cull, so I certainly knew in my mind what needed updating and replacing. I didn’t get much, only 4 items from 3 stores. But, it’s all about quality, not quantity when it comes to building your wardrobe. So what did I get, I hear you say? Well, a totally comfortable and practical sweater cardigan and infinity scarf, a very edgy fleather sleeve knit top and some killer heels for some fun on my next date night or night on the town. (Since I bought them, I have now booked date night with my darling husband). Nine West Heleneo Black SU Pump Heel. You know I love a bit of leopard print AND I love things a bit different, so this was a good shake up on the regular black heel. $42. 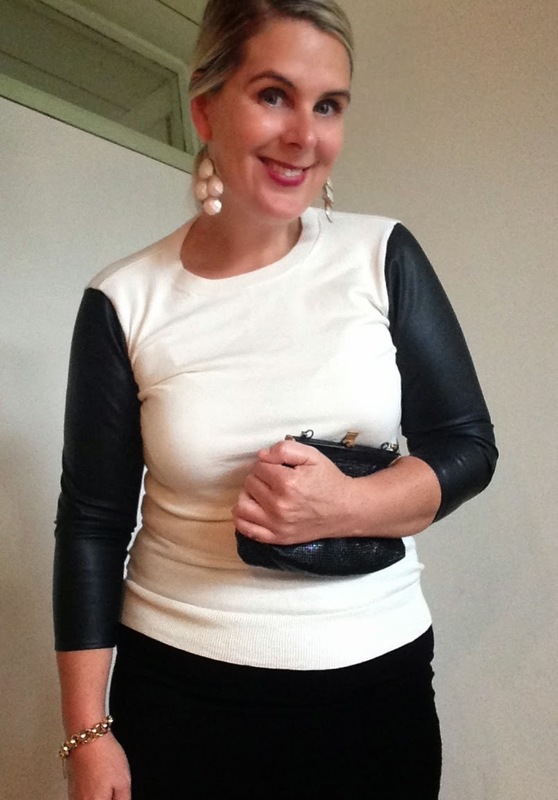 Next up, a Fleather (fake leather) 3/4 sleeved top from Ann Taylor. Retails for $89, YummoMummo price was $32. Super comfortable, edgy and stylish. The cream knit feels like great quality, I think this top is going to wear VERY well. This sweater could be more versatile than it looks. It’s more dressy with the fleather sleeves but you could wear it totally dressy or more casual. I am wearing it with a black pencil skirt and heels, but to dress it down, I would wear it with some boyfriend jeans and my cheetah slip on flats or a simple black ballet flat. And at the price, it’s not too precious a piece to worry about saving for special occasions. Note: this really didn’t look fabulous on the hanger so it’s an example of trying it on despite that, as I found a gem! I needed to replace my cream sweater cardigan that I had from donkey’s years ago. Now my little one sleeps with my old one as a security blanket. I love versatility in an item of clothing. This sweater cardigan is an extremely soft knit. It’s 55% cotton, 25% acrylic and 20% nylon. I like that the sleeves were also a little longer so I can pull them a bit over my hands when I’m outside in the cold. I think the sweater and the infinity scarf go great together or separate. 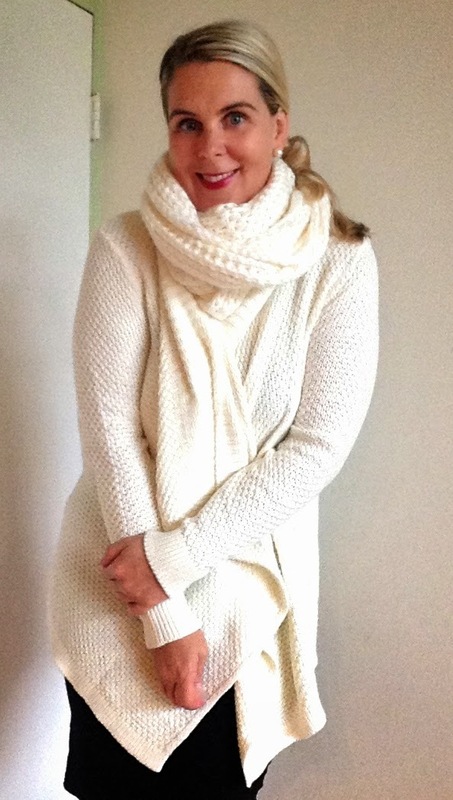 Together they feel like a beautifully warm hug, a sweater and scarf combo are good for the soul on the cold days. Both from Loft. Loft sweater was $60, down to $30. Scarf from Loft, originally $40, down to $20. 100% acrylic. So my shopping trip only cost me $124 by going to the outlets and taking advantage of the Thanksgiving sales. Hope you enjoyed my sharing what I purchased. Got a comment? You know where it goes, down below! Keep on Stylin!